We offer the opportunity to serve in a healthcare, education, or social service ministry within the Bon Secours Health System. 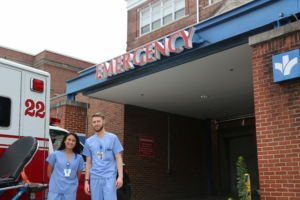 In recent years, volunteers interested in the healthcare field have ministered in Patient Advocacy, Public Health, Community Nutrition, Behavioral Health, in the Renal Department, Diabetes Education, and on the Inpatient Floors at Bon Secours Baltimore Hospital. They have also served young children and parents at Bon Secours Family Support Center and women experiencing homelessness at the Bon Secours Women’s Resource Center. While these are examples of recent ministry placement sites, please know that ministry placement sites evolve and change with the needs of the community. The placement site is decided upon after the volunteer is accepted into the program and commits to serve with BSVM. Applicants who apply by the Priority Deadline of January 15 will have the broadest selection of placement sites available to them. 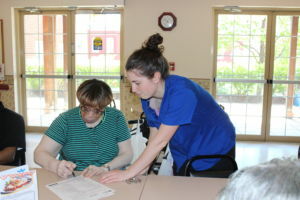 During the interview process, future volunteers and staff mutually discern which site best uses the volunteers gifts and addresses the needs of the community. Begin your application here. Keeps office tasks such as filing or paperwork to a minimum, only as part of the expected responsibilities and not as the volunteer’s primary role.